2018 Women's Professional Rodeo Association World Champion Barrel Racer Hailey Kinsel and her award-winning mare DM Sissy Hayday used this 16.36-second run to win the finals and the overall championship at the Fort Worth Stock Show & Rodeo. Kinsel won more than $16,700 and, like all event winners, received a $5,000 cash bonus. FWSSR photo by James Phifer. Justin Shaffer of Hallsville, Texas, qualified for the championship finals round in 12th place, so he was the first steer wrestler to compete. He promptly set the pace with a 3.1-second run. That was not only the fastest time at the 2019 rodeo, but the fastest since record-keeping began in 1950 by one-tenth of a second. Clark credited “the little gray horse I ride and Jule Hazen, a great hazer to have on the other side” for his win. Culling says his mare was a bit nervous in the box. The Canadian steer wrestler also says winning this rodeo and the $5,000 cash bonus each winner receives was a dream come true. For the second consecutive year, a cowboy named Crawley won the saddle bronc riding title. This year, he did it in record-breaking fashion. Sterling Crawley of Stephenville, Texas, whose older brother Jacobs Crawley won the championship last year, was tied with past world champion Zeke Thurston for the lead coming into the finals. After Thurston tallied 255 total points with an 87-point ride, Crawley needed to match that score to share the title. Tie-down roper Marty Yates of Stephenville, Texas, also came into the finals in fourth place. He and last year’s Fort Worth champion Shane Hanchey of Sulphur, Louisiana, both stopped the clock in 8.9 seconds to tie for first in the finals. Yates’ overall time of 26.6 gave him the championship and the largest paycheck of any cowboy this year—$15,919, plus the $5,000 cash bonus. 2018 Women’s Professional Rodeo Association World Champion Barrel Racer Hailey Kinsel and her award-winning mare DM Sissy Hayday used this 16.36-second run to win the finals and the overall championship at the Fort Worth Stock Show & Rodeo. Kinsel won more than $16,700 and, like all event winners, received a $5,000 cash bonus. FWSSR photo by James Phifer. The biggest winner of the rodeo was 2018 Women’s Professional Rodeo Association World Champion Barrel Racer Hailey Kinsel of Cotulla, Texas. Kinsel did not place in the first round but won the second round and came into the finals in third. She and her palomino mare DM Sissy Hayday (“Sister”) won the finals with a time of 16.36. Sydni Blanchard of Pueblo, Colorado, the overall leader when the night began, was the last cowgirl to ride. Her horse Famous Heartbreaker stumbled on the first turn, taking her out of contention. Watch Kinsel’s interview and short-round run here. Only two bull riders were able to stick on the backs of their bulls for the full eight seconds. J.T. Moore of Alvin, Texas, was the first qualified ride, scoring 88 points on J Bar J’s bull Nixon. The next to ride was Foster McCraw of Grimes, Texas. McCraw, who was third overall coming into the finals, rode Rafter G Rodeo’s Chosin One for 90 points to secure the championship. Adam Rose of Willard, Missouri, and Jett Hillman of McAlester, Oklahoma, earned the team roping championship. Their 5.9-second run in the finals was only good enough for fourth, but their total of 16.3 was fastest overall by two-tenths of a second. They moved into first place after ranking second when the night began. 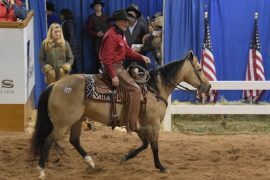 Next year, the World’s Original Indoor Rodeo moves into the new Dickies Arena on the south edge of the complex, while Will Rogers Coliseum will host other equine and livestock events. Article by Johna Cravens, provided courtesy Fort Worth Stock Show & Rodeo. Barrel Racing: Final Round – 1, Hailey Kinsel, Cotulla, Texas, 16.36 seconds, $3,833. 2, Jimmie Smith, McDade, Texas, 16.45, $2,875. 3, Ivy Conrado, Nowata, Okla., 16.51, $1,917. 4, Michelle Alley, Madisonville, Texas, 16.56, $958. Bull Riding: Final Round— (two rides) 1, Foster McCraw, Grimes, Texas, 90 points on Rafter G Rodeo’s Chosin One, $2,700. 2, J.T. Moore, Alvin, Texas, 88, $2,300. (total on three) 1, McCraw, 254, $8,564. 2, J.T. Moore, Alvin, Texas, 250.5, $6,566. (on two) 3, Garrett Wickett, Battle Creek, Neb., 168.5, $4,853. 4, Joe Frost, Randlett, Utah, 165, $1,998. 5, Sage Kimzey, Strong City, Okla., 161.5, $1,998. 6 (tie), Jeff Askey, Athens, Texas, and Brody Yeary, Morgan Mill, Texas, 160, $1,285. 8, Dalan Duncan, Ballard, Utah, 158, $856.